The Last Station is a film about death and dying, yes, but it’s also a film about life, the fragility of experience and the expressive potential of cinema. 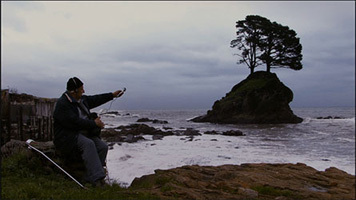 Co-directed by Cristian Soto and Catalina Vergara, The Last Station begins as an austere portrait of a Chilean nursing home before slowly transforming into a delicately-tuned act of poetic empathy. The film opens with a shot of a tree, that eternal symbol of old vitality, which serves as a perfect introduction to Soto and Vergara’s subtle-yet-dialectical visual style, a potent mingling of images evoking death and life. The opening scenes are quietly harrowing, with the poor dying bodies framed like statues, seemingly lifeless, but somehow still full of dignity. The conditions are clearly not ideal, but the focus is never on the “issue” of a decaying infrastructure or broken families. With their patient observational style, the filmmakers are more interested in a deeper understanding of the profound spark of humanity buried inside these dying human bodies than the walls crumbling around them. Early on, The Last Station feels almost too familiar to a viewer who has seen his/her share of nursing home documentary portraits. The heavy stasis of the opening moments serves a clear purpose, though, creating a canvas for the subtle strokes to come. When a voice comes over an internal radio station saying, “Good morning, grandmas and grandpas,” the good-natured humor and genuine pathos remind the viewer that these are not people simply waiting to die. Images of the stubborn vitality of life accumulate: a man cleans foliage from the yard, another man types purposefully-but-mysteriously on an old typewriter, a woman checks on her sick friend, a magnifying glass is wielded vigorously to uncover some unnamed story. At the heart of the film is the radio station deejay, a resident of the home himself, who acts at once as entertainer to his people and voice of their discontent. The sequences of him recording and playing back sounds he’s gathered from nature are masterful in their depiction of our everlasting need to communicate, to move, to give. And it is the deejay who declares, as he leaves the home for possibly the last time, “Do they leave us here, or do they throw us away?” These people are not done with living. A choir prepares to sing “Swing Low, Sweet Chariot” in broken English in honor of a friend lost, as a snail moves up a tree, surviving. The shot of a bedridden man with children playing out his window is one of the most devastating images of life ever captured. Yet it is the preparedness for the end that gives The Last Station its real power. A poem about dying is read over images of sleeping, fragile human beings. Its last words are “I’m ready.” The final several scenes are truly haunting, partly because they each evoke The End so strongly that the viewer is somewhat surprised when the film keeps going. This is, of course, a perfect metaphor for how one passes into the great unknown. The masterful combination of cinematic form and character empathy marks The Last Station as a major nonfiction work. Where the filmmakers finally decide to rest their movie, on a final image of true transcendence, makes it a vital piece of cathartic art.